On September 8, III./St.G 2 was relocated to Slovakia where, at the Zipser-Neudorf airfield, a new attack group, “Angriffsgruppe Schultheiß”, was formed. It operated as part of Luftflotte 4. The Stukas’ main targets were railway junctions and Polish army concentrations in the area of Lviv. From September 17, aircraft of St.G 2 “Immelmann” were sent to bomb Warsaw. Raids were continued until the capital of Poland capitulated on September 27, 1939. Total losses of St.G 2 “Immelmann” during the campaign in Poland amounted to twelve Ju 87 B aircraft destroyed. Dive bomber pilots scored two aerial victories over Polish fighters. At the beginning of October 1939, St.G 2 was transferred to airfields in the western part of the Reich. During winter of 1939/1940, flying personnel of St.G 2 underwent intensive training in preparation for operations in the Western Front planned for spring 1940. A task that lay ahead of “Immelmann” Stukas was to destroy the Belgian Eben-Emael fortifications. On a target range at Hildesheim, pilots of the unit dropped cement practice bombs on the forts’ contours that included gun emplacements and machine gun nests. German “Fall Gelb” offensive in the Western Front began on May 10,1940. 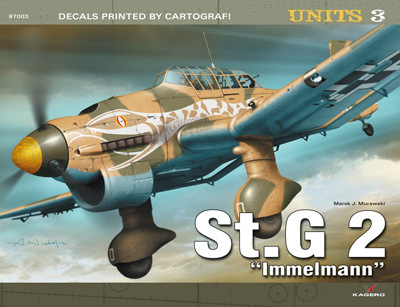 All units of St.G 2 “Immelmann” took part in the operation. Dive bombers of III./St.G 2 appeared over the Eben-Emael fort at 5.10. Belgian troops took cover in air raid shelters during the attack and before they managed to man their positions again, German troop gliders had already landed at the fort. During the course of May 10, 1940, formations of Stukas from I. and III./St.G 2 would appear over the forts and bridges at the Albert Canal every several minutes. They flew missions in support of the paratroopers repelling counter attacks of the Belgian army units. Dive bombers contributed not only to the capture of the Eben-Emael fort but also helped to hold the bridges on the Albert Canal until arrival of the Wehrmacht units. On May 11, aircraft of St.G 2 flew four missions in support of the 6th Army units in their assault over the Meuse towards Allied defensive positions at Dyle. Stukas also bombed forts at Namur and Liege. The Germans encountered heavy resistance in the air. A large group of Stukas from Stab and I./St.G 2 that, at 15.00 bombed targets near Brussels, was attacked by six patrolling Hurricanes of No. 87 Squadron RAF. The British shot down six Stukas at a cost of only one aircraft. On Sunday, May 12, 1940, squadrons of St.G 2 continued their operations in support of the fast advancing 6th Army units. Within the next few days, Stukas concentrated their attacks on the Maginot line at Sedan. From May 16, St.G 2 carried out missions against Allied units in Belgium where, on the border of the northern and southern front, German panzer units were breaking through Allied defences. On May 20, 1940, perfect coordination of dive bomber, infantry and armoured units’ operations allowed the Germans to capture Dieppe and reach the coast of the English Channel. Until the end of May, St.G 2 participated in operations in the area of Dunkirk, Calais and Arras. In the second phase of the French campaign that began on June 5, 1940, St.G 2 actively supported the 6th Army operations to break through the front line at Somme and later, in fights at Peronne, Amiens, Roye, Chauny and Nogent, the unit’s aircraft flew missions in support of the 6th and 9th Armies’ advance towards Paris over the Marne, Seine, Yonne and Loire. Until June 12, crews of St.G 2 fended off a French armoured brigade’s counter attack. Stukas bombed a group of tanks concentrated for attack in area 10 km south of Roye. During the raid, the Germans destroyed or damaged about 30 vehicles. On the next day, III./St.G 2 was visited by Gen. Obst. Milch who expressed his gratitude for the successes that the unit had achieved. After the fall of Paris on June 14, 1940, the French resistance was practically over. During the French campaign, II./St.G 2 operated as part of II. Fliegerkorps in support of the 4th Army’s advance. Battle of Britain – July/August 1940. The first phase of the Battle of Britain began on July 10, 1940. Crews of St.G 2 flew their first combat mission on the next day when, in the afternoon, a dozen or so Ju 87s of III./St.G 2, along with other Ju 87s from IV.(St. )/LG 1, received orders to bomb Portland. After conclusion of operations in France, II./St.G 2, part of St.G 3, flew missions from the Lannion airfield in Brittany against shipping on the English Channel. After heavy losses inflicted by the RAF fighters in July 1940, the unit and was withdrawn from combat for a period of two months. Over the next month, units of St.G 2 flew sporadic missions against shipping on the English Channel. The biggest operation took place on August 8, 1940 when dive bombers attacked the C.W. 9 “Pewit” convoy. Another important operation took place on August 16, 1940. Forty aircraft of I. and III./St.G 2, escorted by Messerschmitt Bf 109 E fighters of I. and II./JG 2, effectively attacked the Tangmere airfield, however, the unit lost five Junkers Ju 87s of I./St.G 2 and four of III./St.G 2 shot down by the British. On August 18, 1940, dive bomber units, mainly St.G 77, sustained heavy losses which forced the Luftwaffe high command to withdraw all Stukas from combat operations over Great Britain.